ComplianceForge is here to help make NIST 800-171 compliance as easy and as affordable as possible. We specialize in compliance-related cybersecurity documentation and we are an industry leader in providing solutions to support NIST 800-171 compliance efforts. Over the last year, we've spent a considerable amount of time building material to help educate businesses on NIST 800-171. This page is a consolidation of free resources to help you get educated on DFARS 252.204-7012 and NIST 800-171 compliance. ComplianceForge was honored to have the chance to write an article for Tripwire on the topic of NIST 800-171 compliance. 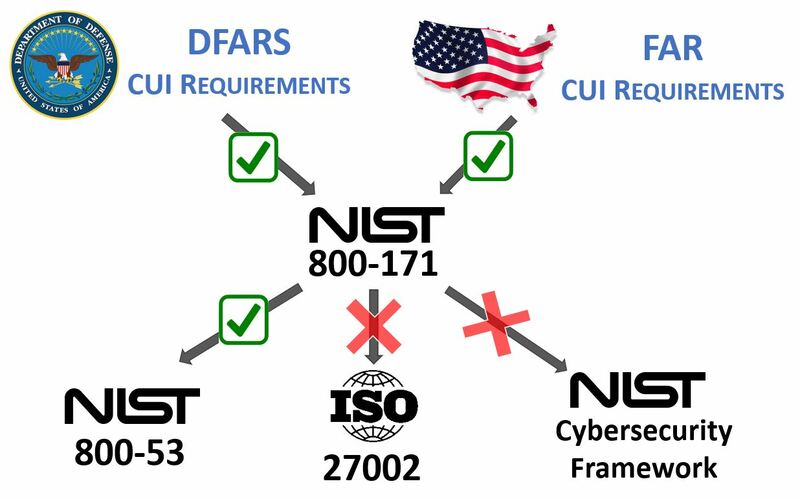 You can read the article here, since that is a fantastic starting point to gain an understanding of how DFARS 252.204-7012, NIST 800-171 and NIST 800-53 all relate. It also covers the issues of non-compliance for companies that fail to meet the December 31, 2017 deadline. If you are not sure where to start, we put together a few short videos with some helpful guidance on how to get on the path to compliance with NIST 800-171. If you want to learn more about NIST 800-171 requirements, such as how to define Controlled Unclassified Information (CUI) and how to minimize scoping, we recommend pouring yourself a cup of coffee and watching the following videos. If you have questions, please contact us since NIST 800-171 is a topic we have a great deal of experience with. The reason we believe there are similarities is when you look at it from the perspective of PCI DSS, if scoping is done poorly, a company's entire network may be in-scope as the Cardholder Data Environment (CDE), which means PCI DSS requirements would apply uniformly throughout the entire company. In these scenarios, PCI DSS compliance can be prohibitively expensive or even technically impossible. However, when the network is intelligently-designed with security in mind, the CDE can be a small fraction of the company's network, which makes compliance much more achievable and affordable. NIST 800-171 isn’t just for Department of Defense (DoD) contractors. Representatives from the National Institute of Standards and Technology (NIST) and DoD officials have recently been putting this information out in webinars and other training seminars on NIST 800-171. This means that only the NIST 800-53 framework is going to meet FAR requirements - ISO 27002 and the NIST Cybersecurity Framework are going to be insufficient in coverage.